Hi i am begginer both arduino & labview programing . I wanna make a school project on labview graph interface and i bought arduino yun for wi-fi . Arduino: 1.5.5-r2 (Windows 8), Board: "Arduino Yún"
AFMotor.cpp:97:5: error: #error "This chip is not supported!" AFMotor.cpp:114:5: error: #error "This chip is not supported!" AFMotor.cpp:134:5: error: #error "This chip is not supported!" AFMotor.cpp:152:5: error: #error "This chip is not supported!" AFMotor.cpp:173:5: error: #error "This chip is not supported!" AFMotor.cpp:190:5: error: #error "This chip is not supported!" AFMotor.cpp:213:5: error: #error "This chip is not supported!" AFMotor.cpp:230:5: error: #error "This chip is not supported!" if any one have any suggestion i will be thanks for him . i have attached screenshot from the VI . For Testing i want to read ADC data using spi of LIFA. I have connected analog Input to the adc IC Mcp3204. cannot find my arduino uno in the init bloc of the labview example read analog In serial (error 5005, arduino not found, check connction and drivers) but arduino is connected and the upload to the uno of arduino FIFA_Base is finished without errror! How i conect this code block to arduino? I use two leds to emit two kinds of lights, and use one sensor to detect both of the light wave. Then I need to seperate them to different waveform and calculate something about them. How can i do that? I need to conect this code block with my arduino uno and also with a RGB Led, that would generate a light variance according to the scale i choose...could someone help me?? The project went really well I got everything running just as I wanted. Ill write you an in depth guide within the next few days. Once everything is running correctly you have complete labview abilities using an arduino either wirelessly or wired. Ill write the guide based on wireless use if you are planning on have the board wired to the computer you can skip those steps. I need to collect 15 analogue measurments and send 5 digital output synchronously with a sample rate of 0.01 sec. What do you suchest me to do? You mentioned one might be able to do that by "createing a custom command that reads x samples from the user specified pins"... could you please give an example of that? I can use multiple arduinos if you think it will help. I had a need to use the Adafruit LDP8806-based LED strip for a project. And I wanted to use LabVIEW to do it. The Arduino provided an inexpensive way of controlling so long as I could figure out the control protocol for the LDP8806. After some toiling, I figured it out using both a bitbang and SPI approach. Bitbang with the Arduino Uno is ridiculously slow; it lies on the LIFA digitalWrite.vi which limits speeds to about >90Hz, effectively, and things get flaky any faster. Although it is interesting to see the slow control of the LED strip, it's not practical to wait so long as a consequence of the communication method. SPI is much faster. New LED states are set "instantaneously". The trick is in the attached "LED_list_to_hex_and_bool.vi". It creates the bytes needed to properly control the LED strip. Read the comments in the VI. The main application is "write_data_spi.vi". Use the default MOSI and SCLK pins (13,11 on Arduino Uno) as the "DI" and "CI" pins, respectively, as labeled on the LED strips. LIFA tool for remotely focusing cameras. We needed to be able to remotely focus some of our IR cameras in the lab so we came up with this solution using ~$100 worth of gear purchased from Sparkfun that uses LabVIEW and Arduino. This little build is extremely useful for situations where we can manually operate the camera on location (For example: https://www.youtube.com/watch?v=pjAIwtdAyQA). If there is enough interest, I would be happy to share the code. All of the parts described in this video are available at Sparkfun (minus the IR camera of course). Hi , i am building a Sentry Gun with a Camera , a paintball gun , 2 stepper motors and an arduino. i am using labview to program the whole project from image processing and recognition to Stepper Motor control via Arduino. i am able to capture and track the image with coordonates of his centre . how can i transfert those coordonates to the arduino so that it can be convert into the angle of rotation or steps for the stepper motor?? i have attached a sample of the code i wrote for the image acquisition and processing . i don t know how to go about sending the coordonates to arduino so that they can be convert into precise steps. I am currently testing the LabView for Arduino toolkit. I need to generate a 0-5V DC voltage out of a PWM channel to control the sensitivity of a photomultiplier. This control voltage will generate a high voltage of 0-1250V at the photomultiplier tube circuit. I have so far just connected an LED (of course plus serial resistor) to the PWM output and can dim the LED with the PWM using a 0-255 control. However, when I connect the LED to the PWM output it is fully lit already when the Arduino (UNO) is conncted to the PC, even though the vi is not yet running, so the lopass would propbably already supply a full 5V to the photomultiplier at that stage. This is not good as a 5V output would switch the photomultipler to its full high voltage of 1250V instantly, whereas I would normally start much lower and increase hi voltage (= sensitivity) only as needed by the light levels. As soon as I start the vi, the LED turns off and I can use the dial to adjust the brightness from zero to full, but the damage will be done to the photomultiplier already, because it receives a 5V control voltage from the Arduino even before the vi comes to play. Why is the PMT output hi and not not zero before the vi starts??? What can I do to force a zero signal at the PWM output when the Arduino is connected to the PC but the vi to control the whole thing is not yet started? This is my first blog post/code share so please don't hesitate to let me know if it can be improved. I was tasked with validating an LCD screen brightness and RGB quality. Fortunately Sparkfun has a color light sensor http://www.sparkfun.com/products/10701. I followed the connection instructions found in the Arduino example sketch and made a few minor modifications to the example code (sketch with my edits can be found on the block diagram of the VI, make sure you have the Wire library installed in your IDE) so that the Arduino outputs the RGB and light values about every 200 ms instead of on request. This VI (LV2012) reads CSV from the port, converts them to 8 bit numbers, renders the values in a color box and records the values in an array of clusters. There is also an offset/tuning adjustment for each color, RED, GREEN, BLUE that are fun to play with. The "CLEAR" value is supposed to be a light measurement but I haven't tried to convert it to Lumens yet. Right now it's expressed as an 8 bit number like the RGB values. One more thing: Don't bother connecting the LED pin on the sensor board, it is so close to the sensor that everything gets washed out and only "white" is returned. Got LIFA_BASE instead of LVIFA_BASE??? I am new to Arduino (but not to LV). Got the Package Manager installed and then got the Labview-interface-for-arduino installed in the LV vi.lib dir the the PM. to the board, but could not find this file. In fact - after installing the Arduino toolkit for LV, I have - in the firmware dir - a LIFA_BASE folder and not a LVIFA_BASE folder ??? Does anyone know how to generate a sine wave on one of the analog outputs using Labview and an Arduino board? I've found some stuff on the web which says you can do it using the PWM output using the arduino compiler/uploader, but I don't know how to translate this code to Labview. I'm new to using arduino and Labview, so any help would be appreicated. I think that LIFA is really an awsome tool by allowing a unique GUI interface to the Arduino. I wanted to share this project that I did for school. It's a wireless electrocardiogram that uses 3 leads. Inside the black box, is the ATMega328 processor (what is found on the Arduino) with all the signal conditioning and a Xbee unit. The device measures 3.8" x 2.4" x 1" and is carried in a simple case attached to a pocket. The ECG signal is transmitted to a computer for LabView to graph. But wait there's more! The ECG is also saved to a database to be viewed in real time over a webpage or Android App. All possible thanks to LIFA. Attached is a word document with device and program screenshots. Hopefully our example will inspire other scientists to use Arduino with their research problems. I have been trying to install LIFA for the last 1month,but am still failing,i have LABVIEW 2010 SETUP. How to aquire 2 sensor analog output using LIFA simultaneously? I am new to LIFA. i have a project , in which i want to continously aquire my 2 sensors anlog voltage signal with labview using ardino. i am able to aquire one sensor output using th example: continous signal aquiring(given in the examples). but i want to aquire 2 sensor signals from analog port 0 and port 1simultaneously. how is it possible? can any one help me please. I'm new to labview and arduino, I have installed all the needed software and hardware need to run labview and arduino uno. I have an easy drive 4.4, stepper motor and power supply. I have done all the arduino learn kit cirects using labview and all worked OK, so I think have all the needed software and hardware correctly. when i try to operate a stepper motor using the labview example (the one which comes with the LVIFA) nothing happens, i tested the motor and the hardware using the arduino example code and the motor work. can someone help me i'm quite desperate. I am creating a multifunction machine being controlled by an Arduino AT MEGA. I am in need of controlling TWO CAN motorized actuators with Lab View being used as my control interface..Does someone have any suggestions as to how to acomplish this? I am relatively new to Lab View and would appreciate any insights here. Hello, my name is Paul and I need some ideas on how to make a project. I need to control a fake antenna (I am saying fake because it won't be attached to anything, just for display purposes) using LabView. The antenna will be very small (about 15cm in diameter and made from light materials). I am using 2 stepper motors with 2 EasyDriver 4.4 drivers and an Arduino UNO R3 board. The antenna needs to move 360 degrees on a round base and 90 degrees of elevation. I found a video on youtube that is a lot more complicated and a lot heavier than what I need, but should give you a better perspective of what I am talking about. I'm trying to get the antenna to track a satellite. I have to enter the azimuth and elevation of the satellite into LabView, and the antenna, from the 0 position (I will use the magnetic north as 0) will have to move accordingly to face the satellite. So the base will have to be capable of a 360 degrees turn (for azimuth) and the elevation a 90 degree angle (for elevation). I drew a quick sketch hoping you will understand better what I'm trying to do. I only connected one stepper motor for a test run. I opened the "Arduino Stepper Motor.vi" in LabView and tested on stepper motor 1. It didn't move (but maybe I didn't set it up correctly in labview). The setup was made exactly as the picture I attached. The stepper motor 1 (which controls elevation) has to move the antenna 90 degrees. So I'm guesing I have to divide the 90 degrees to 1.8 degrees (the motors deg/step) to find out how many steps I need in total. And the same for stepper motor 2 (360 / 1.8). So I need a .vi that automaticaly transforms the degrees which you set the elevation and azimuth to steps for the stepper motors. And when I press "Start" the two motors move to the desired position. I also need a "Reset" button to automaticaly come back to the original position (which will be 0 degrees azimuth and 0 degrees elevation - let's say the magnetic north) each time I run the program. And one more thing: is there an explanation document for the "Arduino Stepper Motor.vi" ? There are a few things I don't know how to set up, like the "Stepper Configure.vi" - seems like anything I change doesn't really do anything and the same thing with the "Init.vi" , "Stepper write.vi", "Stepper ToGo.vi" or "Stepper Close.vi". I've a bit of a problem. I'm trying to program my Uno to send PWM voltages to a wheelchair (to direct it). Sounds simple, right. Well LIFA is all new to me. I built a simple program to send the signal in response to a button (boolean). As you would guess, the program needs to run continuously. My problem is that the voltages keep cycle without giving either a steady 1.25V when true or 0V when false. I need these values to be steady to get the chair moving. Attached is one segment of the program (all other segments will be similar). I am receiving error code 5005 when trying to run the examples from Labview. I have the Arduino Uno/LabVIEW 2011 bundle running on Windows XP SP3. I have sucessfully installed all the Software and drivers. 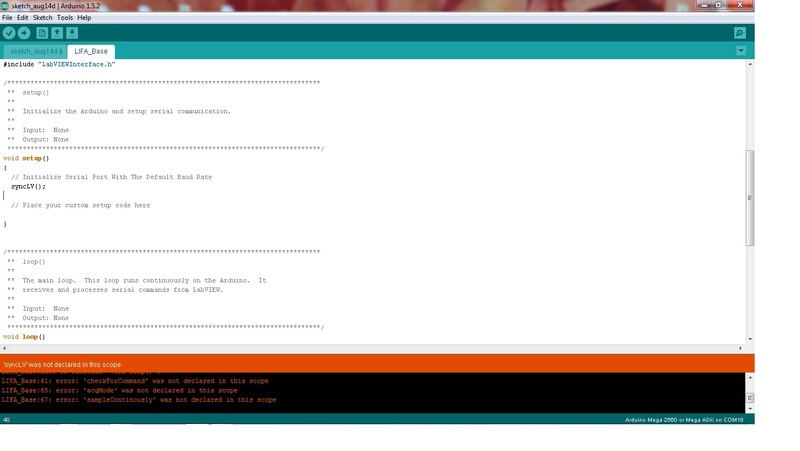 I have also successfully uploaded the LIFA base to the Arduino Uno. I have noticed that after installing the Arduino Uno driver, the port displays as "Communication Port (COM3)". All the installation screen captures I have seen have the port listed as "Arduino Uno (COMx)" where x is the port number. The Arduino Uno is on COM3. MAX has verified the port without errors. Could the COM port name "Communication Port (COM3)" be the reason for Error Code 5005? Please, I need some help.